The Rotor Adjustment Wrench consists of a 3/32 allen key, two convenient finger loops for gripping and an opposite side arc adjustment key for easy rotor adjustments. Adjusting your rotors yourself is easy. Most residential rotors are adjusted the same way. See the video linked to our item page for details. 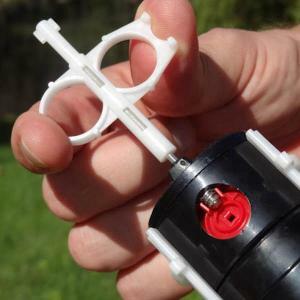 The Rotor Adjustment Tool suits all Hunter gear-drive sprinklers plus the HydroRain HRX075 and Orbit Voyager II and fits some Toro & Rainbird gear drives.